Slam Funk is inspired by the 70's era. Created by Microgaming, it is a web-based instant win scratch card. All basketball fans know about slam dunk, so you might question where does funk figure in the game. Well, Slam Funk has a dance floor, a flashing disco bar and cool disco music. Top basketball players often show their dance moves after scoring on the court. A group of cartooned disco-grooving basketball players, as well as a cheerleader, star in the game. The players look rather unusual but they bring the game to life thanks to their fun personas, creative dance moves and witty antics. With its fun animation, groovy disco music and well-balanced colors, the game is both a visual and audio treat for gamers. It also earns extra points for its player-friendly interface and easy gameplay. This feature makes it very appealing to players whether novice or expert. Additionally, bet options are friendly on the pocket as they vary from $0.50 to $10. An added feature is the "Reveal All" button that scratches all of the nine sections automatically so you can play faster. But you can also scratch it yourself if you opt to do so. The graphic scratching gives the game a more realistic feel for scratch cards. The jackpot is at $2,500 and three matching symbols activate the characters. You can see them move to the music with added sound effects. Furthermore, every combination has a different animation that adds to the thrill and challenging aspect of the game. It surely does motivate you to win. With the nine slots available, all of which have funky dancers and a payout multiplier of up to 250 times, winning can be done through many ways. Their return to player percentage, which is an indicator of how often players win, is at 95.04%. The jackpot is also won more often compared to other online games of scratch card. 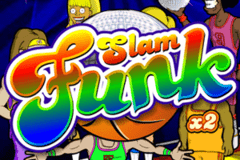 If you wish to relive the disco fever and play a little basketball, Slam Funk will satisfy these and have you truly enjoying.